The First Night Time Baseball Game in Arkansas was played under electric lights at West End Park in Little Rock, AR on July 13th, 1894. Rose Citys Defeated the Uncle Joes. Score 6 to 4. A large crowd witnessed the game of ball at West End Park last night between the Rose Citys and Uncle Joes. The First regiment Band discoursed delightful music both before and after the game. The First Regiment Band has greatly improved and is now one of the best in the State. Baseball by electric light is a new thing in Little Rock, but as predicted it was a success. All those in attendance expressed themselves as delighted with last night’s game. The game was considered a success, but there are no accounts of any similar night games played in Arkansas thereafter. 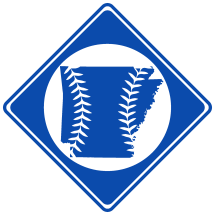 In fact, the next known night game in Arkansas wasn't until July 21st, 1930 when the Little Rock Travelers and the Birmingham Barons played the first night time game in the Southern Association at West End Park, then known as Kavanaugh Field.